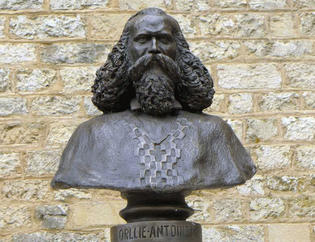 Antoine De Tounens was a French adventurer who was born on the12th May in 1825 in the hamlet La Chèze at Chourgnac, not far from Tourtoirac. He died on the 17th September, 1878 at Tourtoirac. He was the eighth son of a farmers family with nine children. His parents were Jean Tounens and Catherine Jardon. He was a talented and sensitive child with a great interest in history. He sold his solicitor practice in 1857, the year that the imperial court of Bordeaux allowed his family to turn their name Tounens to "Le Tounens". And his family borrowed 25.000 francs from the Crédit Foncier de France to help him with his plans for an expedition. He also joined the freemasonry. But when he was dying, he turned himself for help to the Holy Roman Catholic Church, as well as to the Apostolic Church, confessing the mistakes he had made, and died as a good Christian. Antoine, with the support of his family, left in 1858 by ship, with a stop at Southampton, for Chile and arrived there on the 28th August, 1858. In the first two years he learned Spanish and made a lot of contacts. He also got in contact with the Machupe Indians, who lived in the Auraucania region and were fighting the Chilean government for their independence. He decided to take their side and support them and in 1860 the Auraucania region had won its independence back. He must have had a lot of charisma, because on the 20 th November, 1860, at the age of 35 years, he was made King of Auraucania and Patagonia: Roi Orélie Antoine I de Tounens. In this way he claimed an extension of his kingdom beyond the Andes up to the Atlantic Ocean and the Strait of Magellan. And immediately he installed the French form of government. Antoine counted on enthusiasm and support from France, that over the years had lost many of its colonies overseas, but France showed no interest and intention to help. He formed an army to fight again, and was captured and held prisoner by the Chilean army on the 5 th January, 1862. He was released with the help of the French Consul and returned to France in October 1862. Back home, his kingdom and title were not acknowledged and while fighting for his cause he ran only into brick walls. During the years 1860-1862, the Kingdom of Auraucania and Patagonia, in a certain way, really existed. But the ministers Lachaise and Desfontaines, whose signatures we see on the royal acts, did not exist. The first name corresponds to "la Chèze" (the chair), the name of the hamlet where Antoine de Tounens was born, and the second to "Les Fontaines", a hamlet not far from the first one. In The National Library one can find traces of a collection of signatures in favor of Antoine Tounens from the summer of 1866, especially in Bordeaux. He also found financial support and went back to Chile in 1869, where he stayed until 1871. Back in France he organized a third expedition, but when he arrived in Chili he was almost immediately arrested, imprisoned and after 4 1/2 months released with the help of the French government. In 1876-1877 he returned to Chili for a fourth time, but got very ill and returned finally, to France. In France and in a bad condition, Antoine finally went to live with his nephew Jean dit Adrien (1844-1889), a butcher in Tourtoirac, and stayed there until his dead on the 17th of September 1878, close to the hamlet where he was born. Because Antoine de Tounens had no children, and none of his family was interested in his kingdom, it was decided that his friend Gustafson-Acille Laviarde would succeed him as King Achille I. After King Achille I, the succession has been continued by notarized acts of the title of "Prince of Auraucania". This title is officially recognized by The French Republic. Until now there have been four Princes. 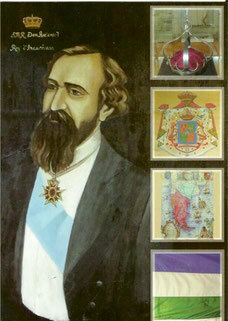 The last one, Prince Philippe d'Auraucania, was very committed to Auraucania and was in contact with Indian organizations in Chile and Argentina. He founded a small museum at Tourtoirac and died in 2014. One could see this all as a lost opportunity for France, had it, in any official way supported Antoine de Tounens. The kingdom of Antoine incorporated a region that in those times did not belong to any state. Meanwhile Napoleon III, from 1861-1867, was supporting emperor Maximiliaan with expeditions to Mexico. Antoine de Tounens did not have many financial resources at his disposal and his social background made him an easy target for the press at that time. This character is well-known in France, for his life was the subject of a particular work of Saint-Loup, The White King of Patagonia (1950) and a novel by Jean Raspail, Me, Antoine de Tounens king of Patagonia (1981). In 1950, after three years of traveling in South America, in which Saint-Loup discovers, through the historian Armando Braun Menendez, the existence of Antoine de Tounens. He decided to "make known the life of this Gascon, that Cyrano of Tourtoirac who, like the other neighbor of Bergerac, gave his life for dreams." The novel he devotes to this "true saint of adventure" is faithful to historical reality. La Película del rey (Argentina, 1986) by Carlos Sorín: a director trying to shoot a film about the epic of Antoine de Tounens. The King of Patagonia (France, 1990), directed for television by Georges Campana and Stéphane Kurc; adaptation of the novel by Jean Raspail "Me, Antoine de Tounens King of Patagonia" (1981); Antoine de Tounens is played by Frédéric van den Driessche. El Reino de Araucania y Patagonia: Braun-Menéndez, Armando: Editorial Francisco de Aguirre. The extraordinary adventure of Antoine de Tounens, Roi d'Araucanie et Patagonie : Magne, Leo: Editions France-Latin America, Paris 1950. 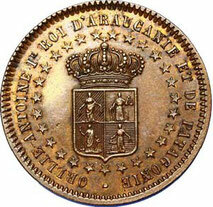 History of the Kingdom d'Araucanie (1860-1979), a French Princes Dynasty Latin America. Prince Philippe d'Araucanie: S.E.A., Paris 1979.